Do you often feel that something is stopping you from achieving your full potential? As a leader, you exemplify and set the culture of your organisation. Understanding how your mind works gives you deep insights into how the minds of others in your organisation work. This will help you better manage how you relate to others while assisting in creating results that you need for higher performance in your organisation. Help your leaders think and make decisions more effectiveness to create the right impact. 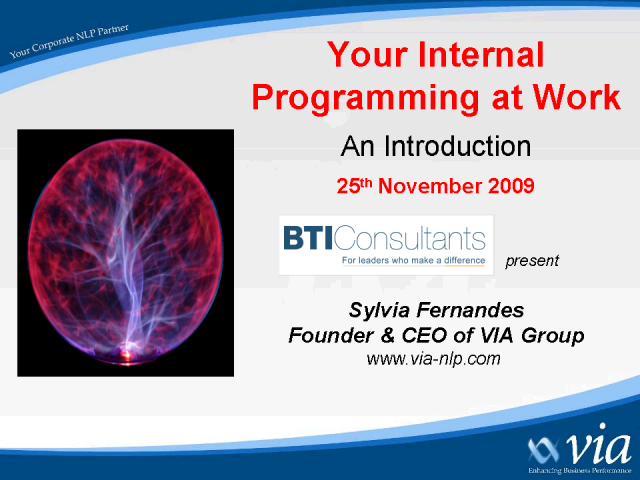 Join Sylvia Fernandes, renowned NLP Trainer and Coach in a session that sets the stage for her up-coming series of webcasts on MINDWORKS and LEADERSENSE. Learn how your mind has been conditioned and how this drives your decisions today. Work through the five senses and understand how this language affects your behaviours. Take easy steps to change your behaviour and achieve outcomes with yourself and your team. Empower yourself today to make a difference with your people!